This shop is located in Nishiki market, near Kyoto’s shopping district. It serves sweets made with soymilk produced by a tofu specialist in Kyoto. Their specialty is soymilk doughnuts. These healthy doughnuts are made with soymilk. The freshly fried doughnuts have a pleasing aroma and a light sweetness. They are small in size, so they are easy to eat, and great for snacking on the go. It is also fun to watch the shop staff fry up the soymilk doughnuts at the counter. 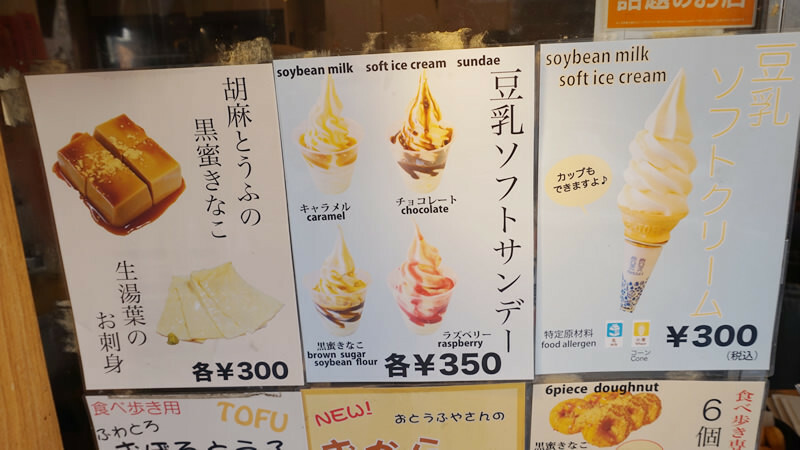 Besides soymilk doughnuts, they also have soft ice cream made with soymilk. While there is a line sometimes, you will have to wait for around 10 minutes at the longest. We recommend it even for people who do not have much time to spare. This is the most popular menu item. The main attractions are the crispy texture and light sweetness. Use a toothpick to eat them. They will harden up over time, so try to eat them on the same day you buy them. You can buy them in batches as small as 10 pieces. * They are not sold individually. Made with soymilk and not too sweet. It has a smooth texture. For groups, we recommend using the spoons available at the counter to share with. The photo shows the ice cream served in a cone. You can also get it served in a cup. This dish lets you enjoy the rich flavor of yuba (tofu skin). They use fresh and rich yuba. The main selling point is its melt-in-your-mouth texture. Add a little soy sauce and wasabi to taste. When buying soymilk doughnuts, we recommend getting 10 pieces for 2 or 3 people, or 23 pieces for 4 or more. They also have a small space to dine in. You are not permitted to eat or drink things you bring with you in the dine-in space. This tofu shop is inside Nishiki Market, but this is not a normal tofu shop. Konnamonja is most famous for their soymilk doughnuts. 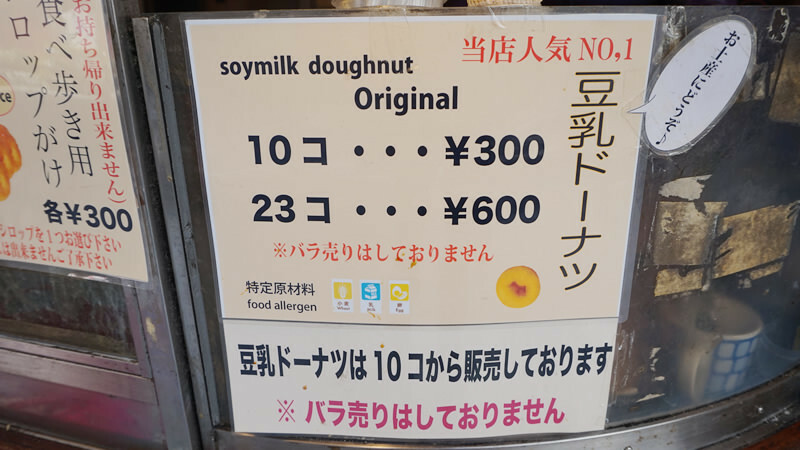 Because they use soymilk the doughnuts are not overly sweet nor greasy and they are small so it feels like you could eat them endlessly. The smallest amount you can buy at one time is ten, but they are small so you should just get some! The tofu doughnuts are to die for. The taste is sweet but maybe because of the tofu they don't feel overly fatty. The doughnuts are small and you get 10 of them so you can share them with your friends. Next time I have to try the Kyoto style hot dog that has tofu tartar sauce on it. It is usually not crowded in the morning. There may be a line in the afternoon or on weekends and holidays, but you will wait for around 10 minutes at the longest.